This is a guest blog from Sandy Salle, President of Hills of Africa, my go to supplier for African safaris. We are recreating Sandy's trip to Kenya, for our trip in October 2020. Here's glimpse of what you will experience. Giraffe Manor is everywhere on Instagram, Facebook, YouTube and more. It almost seems as if everyone wants to be at Giraffe Manor. I was lucky enough to spend a night at Giraffe Manor recently and I have to tell you it’s better than seeing the property and giraffes through the social media lens. I felt like a kid in a candy store. I was fortunate to stay in the Garden Manor at Giraffe Manor, in a beautiful room called Kelly. 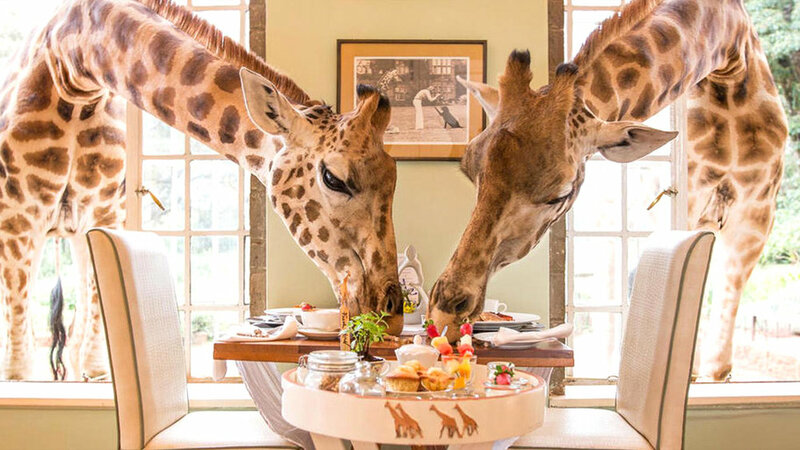 We were told the night before, over a delicious dinner, that the Rothschild giraffes come for breakfast and that we had food in our rooms to give them. Well I could hear something outside my room at about 5am. I tried ever so quietly to walk across the room to the window, as I didn’t want to wake my friend Tracey. I saw outside in the complete darkness one of the giraffes – I of course woke Tracey up, who said “it’s way too early Sandy, go back to bed”. I am an early bird so it was a pointless effort. 5.30am, peek outside the window again and the giraffe is there. Tracey’s not waking up, what do you do? Just get up and feed this gorgeous giraffe in total darkness with pellets. 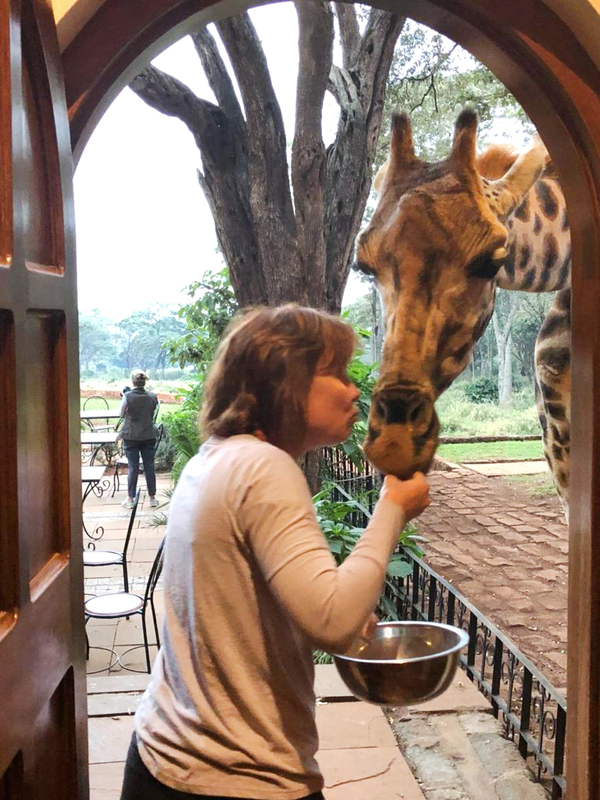 I then needed some coffee, so went downstairs and the giraffe wants more – even when we ran out, she managed to sneak a rose from the vase and munched that. 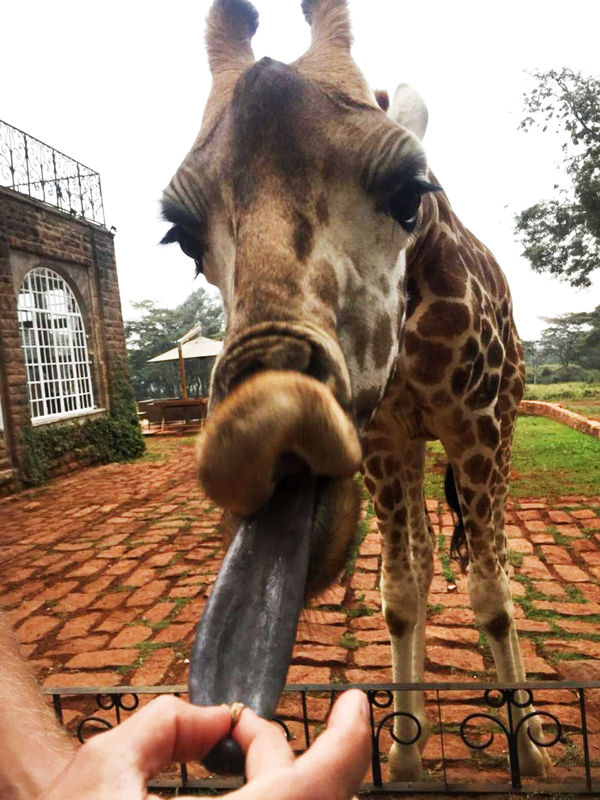 Giraffe Manor is a special place – you can be a kid and wake up at 5am all giddy with excitement to see these beautiful animals, or you can be an adult and pretend to kiss them. If you’re a movie buff, you can even pretend that you’re walking into the film “Out of Africa” and stay in the Karen Blixen Suite. If you’re staying at Giraffe Manor, a couple of things to remember. Good times to see the giraffes at The Manor are early mornings for breakfast and afternoon tea, when the giraffes come to the terrace for food and kisses, whilst you are having a gorgeous cocktail. I’m not sure which is better, so why not give yourself two nights to really soak in the beauty of this gorgeous property, whilst also being able to experience some of the other activities in Nairobi, for example the David Sheldrick Elephant Orphanage where you can visit with baby elephants that have been rescued from the wild. So instead of looking at social media, I highly recommend you start living in the now and get yourself to Kenya and stay at Giraffe Manor. You will never forget this experience. Needless to say the demand for space at Giraffe Manor is high and availability is low. You really do need to sign up now, for 2020, so we can confirm the space we are holding. Giraffe Manor is just the start of this amazing adventure in Kenya. Come with me, you'll be so glad you did.